Evernote Bikes! : Bikes. Rants. Adventures. I kept seeing this bike around town - around Caltrain, my commute, riding around the peninsula on the weekends, I saw this bike everywhere. 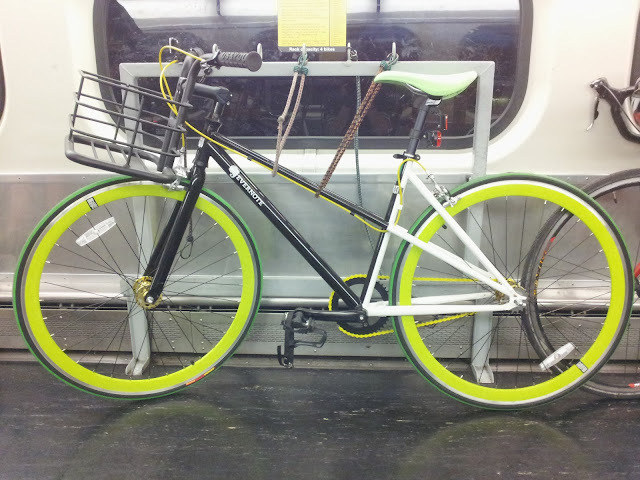 First I just thought that the guy riding it just must be extremely dedicated, and then I happened to board the train with him one day, and I learned the truth: his bike was part of a fleet of bikes that were given to employees that needed them, by a company called Evernote. It's impossible to get my phone to focus on a moving train. As it turns out, Evernote commissioned Republic Bikes for a fleet of their own personalized SS/Fixed Gear rides, available to employees that expressed a need for them to commute. There's this nifty black and white mixte that I see the most, as well as another traditional model that I found a photo of here. All of the bikes have a basket, lights, and a flip-flop hub. According to the guy that I spoke who worked for Evernote, there was so much demand that they ran out of bikes. No news on whether or not they will be making more. I love seeing companies do things like this, whether it's offering bikes to employees or giving them incentives to ride, or local businesses that reward cycling customers. Rain tomorrow, so it looks like I'm steering clear of the velodrome and regluing some tubulars.